You seem a lover-ly sir! That’s what I said to the sir. He had no peanuts to give me. He just looked at me through a big, black eye that made a funny noise when it blinked. Like a snappin’ twig! CRICK! The sir didn’t scare me, no no no! My mother always said one should be scared of sirs, but he was a NICE sir. A lover-ly sir! All peanuts and fruit and lover-ly! Mother would be proud o’ him if he was a one of ussems, but he wasn’t an ussems. He was a sir, but no barky-barkys here. No string-falls, no trap, no trap. Not this sir! Like I told you, told you, told you again! He was a lover-ly sir! He smelled like he would have peanuts. 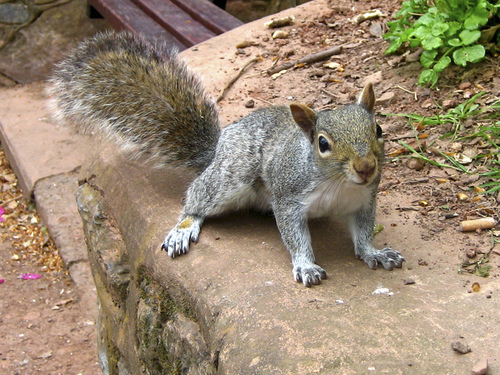 Image is “Tame Squirrel” by Jerry Cooke. Next So Much Love – Kneehigh’s "Tristan & Yseult"